The mother of a young woman left with a severe brain injury after a hit and run in Armthorpe, Doncaster, hopes her daughter will now be able to focus on her rehabilitation after seeing the driver responsible sentenced to eight months in prison. Danielle Stotton suffered life-changing injuries when she was knocked over and left fighting for her life in August 2014. She has had to learn to talk and walk again and whilst she has made amazing progress there is still a long way to go. Danielle was able to attend Sheffield Crown Court to see Sarah Livesey sentenced to 8 months in prison and a two year driving ban. The 26-year-old was arrested by police after the collision in August 2014 and pleaded guilty to causing injury by dangerous driving, dangerous driving, failing to stop after an accident and failing to report an accident. Following the collision, Danielle spent three months in hospital and several months at Magnolia Lodge Neurorehabilitation Unit at Tickhill Road Hospital. She continues to have regular therapy. She has amazed doctors and therapists with her recovery so far, which her Mum, Michelle, says is a reflection of her determination to get better and the support received from family, friends and her treating team. Caroline Mitchell, a specialist serious injury lawyer at Irwin Mitchell, has been working with Danielle and her family since the early days after the collision and has been delighted to see her progress. She said: “Danielle has shown amazing determination so far and is making fantastic progress, but she still has a very long road to recovery ahead of her. “We hope that now the criminal case is over, Danielle can place even more focus on her rehabilitation. We are working with Danielle to secure her the necessary funds to help with this process and to make sure she gets the specialist input she needs. 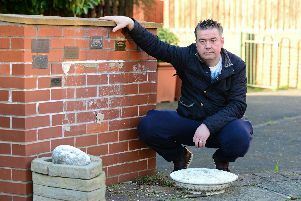 Michelle, 41, from Armthorpe, said: “It has been a complete nightmare since the accident. Danielle suffered horrendous injuries and was left fighting for her life in the road. Our lives have been turned upside down. “It has been amazing to see the determination Danielle has shown and we are extremely thankful she has kept her sense of humour and optimism even though she is often frustrated that she still can’t do many things she had previously taken for granted.